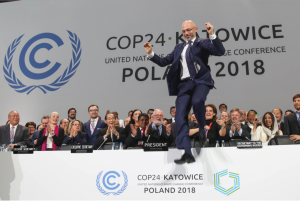 Hosted by Poland, the 24th Conference of the Parties to the UNFCCC (COP24) took place in Katowice on 2 – 14 December 2018. The meeting’s main goal was to finalise the detailed rules for the implementation of the Paris Agreement – the so-called Rulebook – thereby enabling parties to turn their commitments into climate action. To a large extent, the conference formally delivered on this, as substantive decisions were adopted in all but one (on market and non-market mechanisms) areas of the Paris Agreement. However, in many areas, decision on important sub-items was deferred. 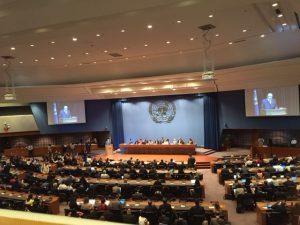 Aside from the adoption of the Rulebook, parties completed the political phase of the Talanoa Dialogue, a year-long facilitative dialogue to take stock of progress on climate action to date, inform the next round of Nationally Determined Contributions (NDCs) in 2020 and boost colle ctive ambition. Many had hoped for a strong political signal on ambition from the Talanoa. The final decision text, however, merely ‘takes note’ of the Dialogue and invites parties to consider its outcome in preparing their NDCs and in their efforts to enhance pre-2020 ambition. Four qualified lawyers, two from private practice and two from academia, supported LRI’s work on the ground whilst volunteers in the London Situation Room and expert advisers from the LRI roster assisted with the advice service remotely. Overall we received 40 queries, mostly from particularly climate vulnerable developing country parties and the group of least developed countries. They reflected the ever-increasing number of subject areas under discussion as well as the dynamics of the negotiations: initially we undertook some broader research assignments, then helped to “word-smith” text and eventually were asked to help analyse the Katowice outcomes and explain what they could mean for national legislation. LRI was also invited to showcase its work at a side event hosted by the UK Department for Business, Energy and Industrial Strategy on Principles of Effective Capacity Building: Supporting the Implementation of the Paris Agreement. This was an opportunity, in particular, to showcase a pilot project developed over the last two years in Cameroon, which tests a ‘bottom-up’, or demand and community driven approach to law review and development. 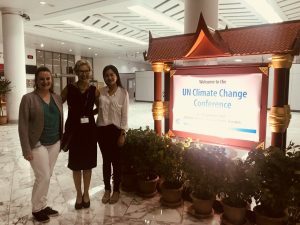 UNFCCC Parties met in Bangkok on 4 – 9 September 2018 to advance their work on the Paris Agreement work programme (PAWP), the set of rules and guidelines needed to operationalize the Paris Agreement, which is due to be adopted at COP24 in Katowice in December this year. Despite the intense pace of work, progress in Bangkok was uneven, with the issues of clarity on finance and how to reflect differentiation between developing and developed countries amongst the main sticking points. With an ‘PAWP compilation’ at the end of the session still running at over 300 pages long, Parties have their work cut out if COP24 is to deliver a successful outcome. 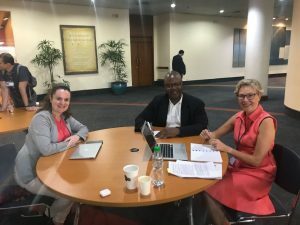 To help advance Parties’ deliberations, the subsidiary bodies ‘ presiding officers have been mandated to prepare, by mid-October, a joint reflections note addressing progress made to date and identifying ways forward including ‘textual proposals’ to serve as a basis of negotiations in Katowice. What is pro bono ? who are the main beneficiaries ? Why do lawyers (and others) do it and what are the rewards ?